Reverend Marvin L. Goodman, Jr. formerly of Winona Lake, Ind., died at 5:21 a.m. on Thursday, April 11, 2013 at his daughter’s residence in Camp Verde, Arizona at the age of 91. He was born on October 22, 1921 in Modesto, Calif., to Marvin L. Goodman, Sr. and Susan R. (Minnix) Goodman. While attending Grace College & Seminary in Winona Lake, Ind., he met his wife Dorothy E. Hay. On June 16, 1944, in LaVerne, Calif., he was married to Dorothy, a union that lasted for 64 years until her death on March 8, 2009. After a risky Pacific Ocean crossing during WWII, Marvin and his wife Dorothy took a river boat up the Congo and Ubangui rivers to the Central African Republic (CAR) where they would serve for 40 years as missionaries. 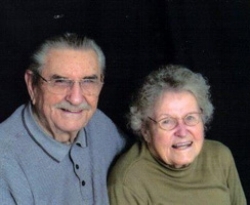 Upon retirement in 1986, Marvin and Dorothy established residence in Winona Lake, Ind., where he was active at Winona Lake Grace Brethren Church where they were members, and he served as a former pastor there. He then moved to Arizona in 2009. He will be lovingly remembered by his two sons: David G. (wife: Nancy) Goodman (Monument, Col.) Paul M. (wife: Marlene) Goodman (Pearland, Tex.) Daughter: Anne (husband Robert) Hoy (Camp Verde, Ariz.), son-in-law: John Zielasko (Hemet, Calif.) Also surviving are 11 grandchildren and 18 great grandchildren, one sister: Eileen Miller (Modesto, Calif.). He was preceded in death by his parents, wife, and his daughter, Suzan Zielasko, the youngest of the four children, succumbed to cancer in October 2003 in her home town of Winona Lake, Ind. Memorial contributions can be made to Encompass World Partners (Grace Brethren International Missions), P.O. Box 588, Winona Lake, Ind. 46590 and would be appreciated by his family. Funeral arrangements are pending with Redpath-Fruth Funeral Home, 225 Argonne Road, Warsaw, Ind. Marvin and Dorothy are the first "real" missionaries I ever met. They came to Sunnyside often where I grew up because their children Paul & Susan lived with the Pastor John Mayes family. What tremendous contributions they have made to the Kingdom & the FGBC! We have people in our church in Quebec, Canada that were saved under his ministry in CAR. The father was 12 when he was saved and now his entire family emigrated and are faithful to church. Praise the Lord for his faithfulness!